PRODUCT DESCRIPTION: Small discreet window trap which is filled with a fine white powder made from egg shells. This all natural powder is safe for people and pets but deadly to nuisance ladybugs. When set out, the foam cover is removed which reveals a thin passage way through which ladybugs will enter. Small glue pads hold the trap in place. This trap also includes special ladybug pheromones which will attract foraging ladybugs to the entry way and eventually, inside. And once inside they will fall into the white powder where they will meet their demise. This happens because once they get into the powder, their feet will no longer be able to stick to any surface and their bodies will get covered in the dust dehydrating them. Once this happens they will quickly suffocate. And once dead they will slowly fall towards the bottom of the trap displacing the light powder so it will be available to work on the next ladybug which enters. Trapped ladybugs will remain odorless, motionless and hard to see since they will blend in with the rest of the white powder in the trap. When discreetly placed out, these traps will work for long periods of time without continued maintenance or messy glue like most window traps. WHERE TO USE IT: On any window which has a ladybug problem. RATE OF APPLICATION: Try to install one on any window which has ladybug activity. The logic here is simple; the more you have out the faster you'll get control of the current ladybug problem. In most homes, its essential to have at least one trap per room. 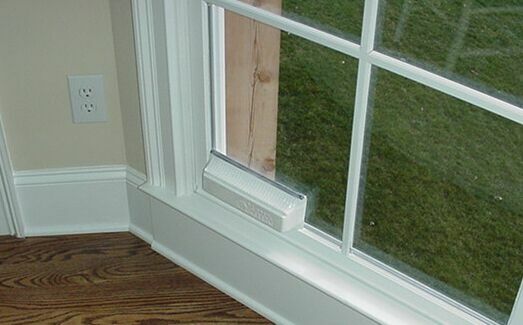 A good installation would be one trap for every two windows in the home and the "ultimate control" is achieved when all windows have one trap installed. WHEN TO REPLACE: In general, each trap can last a long time but it does have limits. These limits are measured by time and/or quantity of ladybugs trapped. The "time limit" is about 1 year per trap. So plan on replacing them annually for "average" ladybug infestations. The "quantity limit" refers to how many ladybugs the trap can hold. This level is about 1000. So if you are badly infested, your trap could get filled in a few weeks and will need to be replaced as it fills. And if you consider your home to be badly infested, be sure to set out enough traps so that one trap is not overloaded too quickly. These were very easy to install, are non-toxic and has eliminated some of the ladybugs.